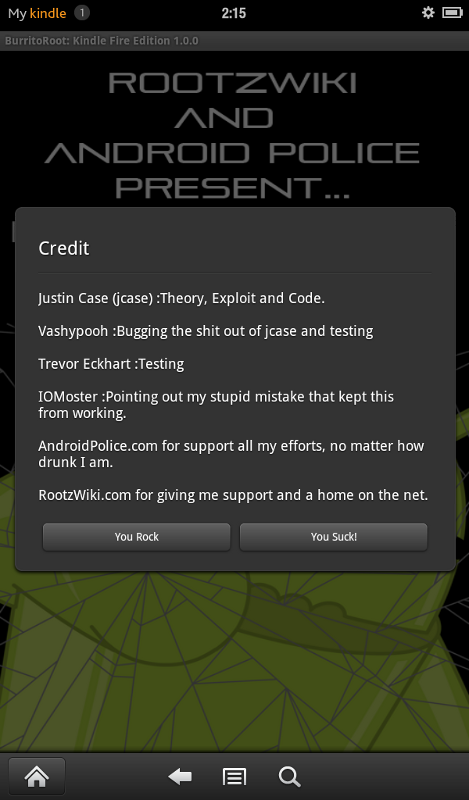 Update: Justin has repackaged the Kindle Fire root app apk, removing encryption and open sourcing the file. Update: BurritoRoot may not work on version 6.0 firmware. If you're having trouble, update your firmware and try again. Seeing the issue, our own Justin Case got right to work; and after a night's worth of coding, with a group of fellow devs helping him through the testing process (namely, Vashypooh, Trevor Eckhart, and IOMoster), he developed a new method to root the Kindle Fire -- a method that works not only on software 6.2.1, but on all currently known versions of the Fire's OS (future updates make break this). Better yet, it's not a hacky process at all; in fact, it's quite simple. Shall we begin? As a prerequisite to rooting the Fire, you'll need to have ADB up and running on your PC. Download jcase's Kindle Fire root app. Run the root app and click "Root." On your PC, in a command prompt, type "adb root." And... that's it! 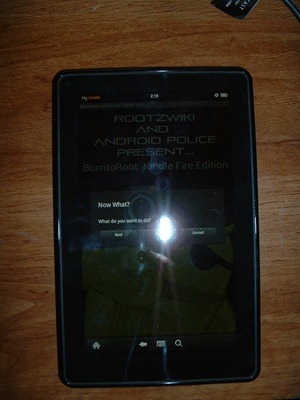 Enjoy your newly rooted Kindle Fire! Should you for any reason desire to unroot your Fire, simply press the "Unroot" button in jcase's Kindle Fire root app. Please direct any technical questions to this RootzWiki support thread.